Osborne County is named for Vincent B Osborne, who was a soldier in the American Civil War. Description: The building faces north and is a three story buff colored brick structure. 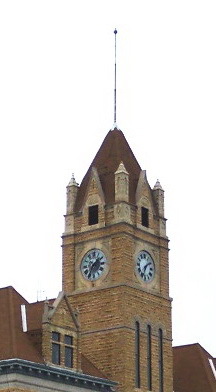 The building has a high square brick clock tower in the center of the north front. The base of the building is white colored limestone. Limestone also frames the entrances. The red colored roof is steep with dormers. One hundred cords of local Septarian concretion rock were used in the foundation, with Cowley County Cottonwood Limestone and Post Rock Limestone from Glen Elder used to build the lower and upper floors. The trim is primarily of Blue Sandstone from Warrensburg, Missouri, with some Georgian granite. The interior walls are lined with Tennessee marble. The floors are of mosaic tile. Ornate green tile fireplaces still decorate many of the county offices and steam heat is still used in part of the second floor. Note: Many unusual stone carvings grace the outside of the courthouse. The Lion represents the qualities of masculinity, strength, watchfulness, and courage. Medusa represents femininity, wisdom, life cycle and mortality. The face of an early settler John Wineland, “The Sidewalk Superintendent,” is found on the south face of the clock tower. Wineland came every day to oversee the construction and irritated the stone masons enough that they carved his face into the rock. Note: The cost of construction of the courthouse was $54,000. See: The architect, J C Holland and Company of Topeka, designed courthouses in Clay County, Geary County and Mitchell County; and in Nebraska in Jefferson County. 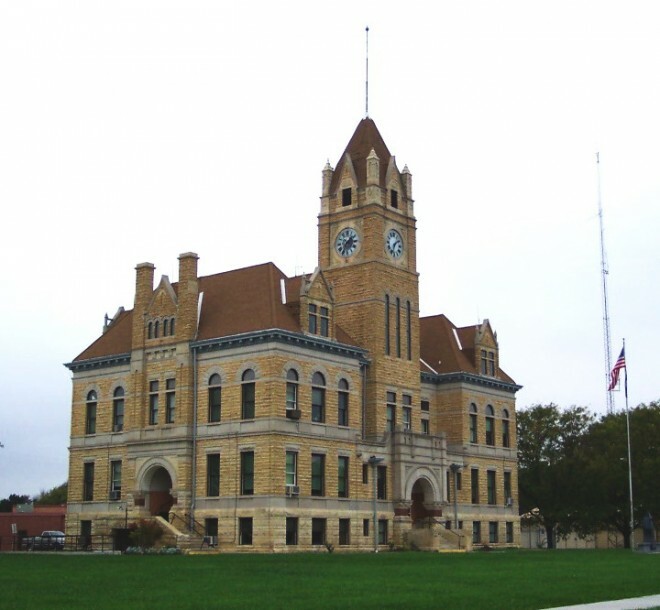 Holland and Son designed courthouses in Ness County and Rice County. With Frank C Squires, he designed courthouses in Riley County and Thomas County. With Charles W Squires, he designed the courthouse in Marion County.